The nerve supply to the thyroid gland is derived from the superior, middle and inferior cervical sympathetic ganglia. These nerve fibers are vasomotor, causing constriction of the blood vessels. The relationship of the thyroid gland and the two vagus nerve branches, the recurrent laryngeal nerve and the external branch of the superior laryngeal nerve, is of major surgical significance because damage to these nerves leads to disability in phonation or to difficulty breathing. 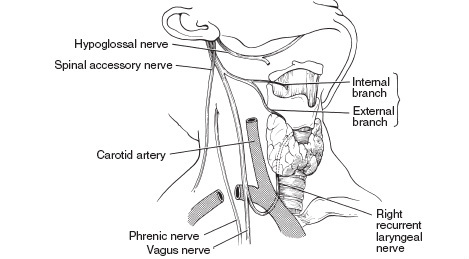 The right recurrent laryngeal nerve arises from the vagus nerve, loops around the subclavian artery, and ascends behind the right lobe of the thyroid. It enters the larynx and innervates its intrinsic muscles, which produce the voice and close the laryngeal opening. 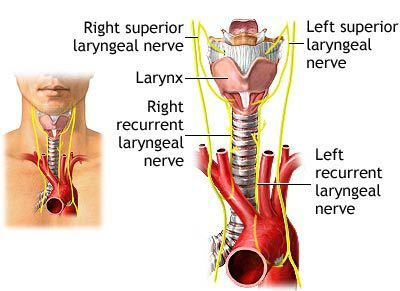 The left recurrent laryngeal nerve comes from the left vagus nerve, loops around the arch of the aorta, and ascends posterior to the left lobe of the thyroid, where it innervates the muscles of the larynx.